I first started making Sgian Dubhs when I couldn't find one that I would personally like to own and wear with my kilt, ie. not a plastic import, while still at a price that I could reasonably afford. Primarily I was looking for an authentic style Sgian Dubh with a carved wood handle that was traditionally decorative without being over the top. Most important it had to be functional and look natural when worn with the kilt. I then set out to make the best quality Sgian Dubhs that I could and I continue to improve my Sgian Dubhs, sourcing better materials and expanding my skills and methods. You may find one of my currently available Sgian Dubhs that you would like, or if you'd like one specially made for you and can wait then please ask me about a Custom Sgian Dubh. Each of my Sgian Dubhs has its own unique character and identity, so each one is assigned an individual serial number, starting 'SG'. 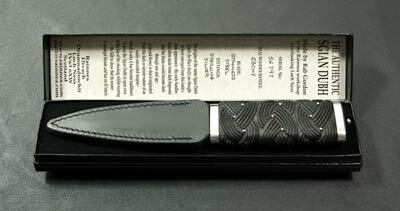 This number is written in the presentation box and can be engraved upon the blade on request. Whether as a gift or for yourself, there are a large number of customisation options. Many of my Sgian Dubhs are commissioned as heirlooms to be passed on to the next generation. While my work can't be said to be completely handmade from start to finish I do invest a considerable amount of craftmanship in what I create. I believe my work to be more art than production but where appropriate make full creative use of modern technology to extend and supplement traditional craft skills. Over a number of years I have developed my own specialized methods, techniques and equipment; by doing so I feel I am able to offer you exceptional quality and custom features while at a price level that is still affordable. 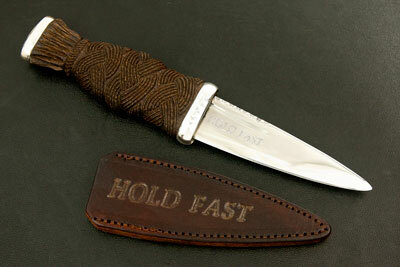 It is always best for long term storage to remove the sheath to allow air to circulate around the blade. Keep clean and dry and apply a very thin film of oil occasionally to the blade. I use Ballistol oil and Camellia oil which is more commonly used on Japanese swords and is food safe, however you may use a good quality olive or walnut oil. Likewise on the handle, but use very sparingly. I hope you'll be pleasantly surprised at how well my Sgian Dubhs compare with the mass produced plastic imitations most often seen or those very rare, expensive and totally hand made Sgian Dubhs. However, I confidently offer a money back guarantee on every one. You can read what previous customers have written here. The handles are cut from local woods where available (the Oak from the family farm in Glen Urquhart carves very nicely) or local stag antlers, as well as traditional exotic woods such as Ebony, African Blackwood and Rosewood which are obtained from suppliers to musical instrument makers. The wood is given an oiled finish and lightly waxed to give a traditional, natural look and feel. 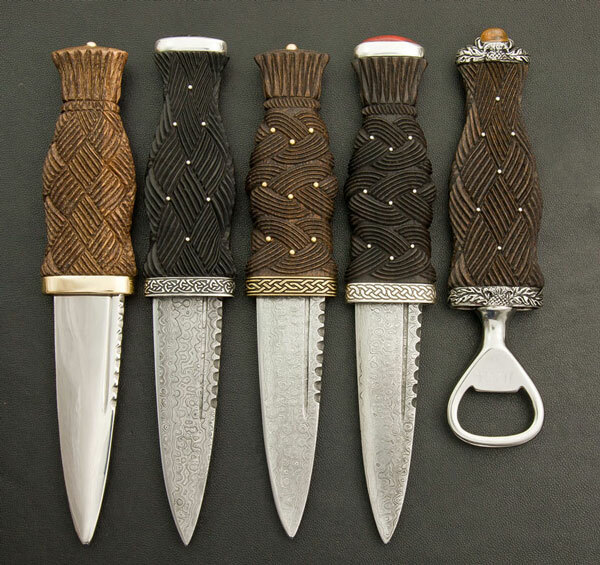 See Sgian Dubh Handles for more details. The metal fittings at the top and base of the handle can be supplied in a variety of metals including Sterling Silver (Hallmarked in Edinburgh to our own registered hallmark: Loch-Ness-Silver), Titanium, Brass and Gold. A variety of real Scottish stones, from around our country can be fitted at the top of the handle, set in a ferrule band. We can also supply imported Amber, Sapphire, Diamonds, etc. 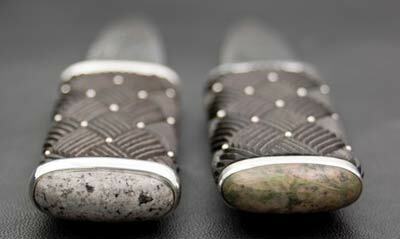 See Sgian Dubh Pommels for more details. These days most Sgian Dubh blades are made from Stainless Steel. See my Sgian Dubh Blades page for more details. For an extra personal touch, initials, dates, or special inscriptions or designs can be engraved onto the ferrules or blade using a diamond point engraver for sharp, clear detail. I can also emboss the leather sheath. My Sgian Dubhs are supplied with high quality leather scabbards with a middle layer to protect the stitching and are available in Brown, Tan & Black, plain or embossed. I can also make scabbards from solid wood. See Sgian Dubh Sheaths for more details. My Sgian Dubhs are supplied in a smart card presentation box as standard which has a card with some information on your Sgian Dubh, including the serial number, materials used, a short background history, and its care and maintenance. We can also supply specially made wooden presentation boxes. Our home and workshop is a converted farm steading overlooking Loch Ness. You're very welcome to visit but please do contact us to make an appointment first. 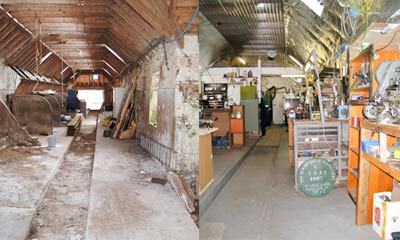 The old cattle barn, here it is before and after. The distant origins of the name Sgian Dubh (Gaelic for Black Knife) are thought to have emerged from this knife's dark appearance - the early handles were often made from dark bog wood and the blade would become dark through use and age. A second theory is that it originated from the dark or sinister nature of an easily concealed weapon - which is why it has become traditional to keep the Sgian Dubh in open view in the top of the stocking whilst wearing Highland attire, usually the Kilt, to show that its wearer is amongst friends and has no ill intent. The Sgian Dubh was not, is not and should not be considered a weapon ! Sgian Dubh is often misspelled skean dhu, sgain dhubh, skean doo, skian doo, sgians dhus, etc. I started making these for occasions when I was travelling by air, etc. They look just the same when worn in the sock.